Szervernet Review 2019: Is Szervernet a Good Hosting? Szervernet has been in business since 2005. The support for beginners is presumed to be low, but all of the usual expert-level features are included, for a budget monthly price. Szervernet is a Hungarian hosting company which has been in business since 2005. It sells a range of services as well as regular shared hosting and the website is available in Hungarian. The shared hosting plans all run on CloudLinux / CentOS operating systems and give customers cPanel access. There are all of the usual features you’d expect, such as support for PHP (versions 4 through 7), phpMyAdmin, FTP, and MySQL databases. If you’re looking for an all-in-one bundle, you can choose the “Small Web Host” package which includes hosting, an .hu domain name, cPanel management interface with FTP, email, web, and database functions. Szervernet includes various security features (firewall, antivirus, and daily data backup) but nothing too groundbreaking. From the website, it’s not clear if there are any beginner-friendly features as there isn’t a website building tool or one-click installer advertised – I tried to confirm with support, but I couldn’t get a hold of the team. Unless there are more features than explicitly advertised on the website, these aren’t the most comprehensive plans. However, the nice thing about Szervernet is the option to scale. If you might need to expand your online presence in the future, Szervernet offers VPS, dedicated servers, and colocation. The prices are listed in Hungarian Forint and are good value for money, compared to both local and international competitors. The catch is that you can only sign up for annual terms, which isn’t super flexible, but it’s quite common with this type of budget brand. Whilst SSL certificates are included in the hosting plans, you’ll need to pay for a domain name. Plus, be sure to consider that VAT is added on top of the displayed prices so that increases the monthly fee quite significantly upon checkout. It’s good to see 24/7 customer service via phone and email. You can contact individual departments e.g., sales, invoicing, technical, or a dedicated 24-hour number. There’s a minuscule help desk, so if you need support you will need to get in touch. I contacted the team via email at around 11:30 a.m. UK time on a Tuesday morning. I wanted to confirm whether there is an uptime guarantee or if there are more beginner features than displayed on the website. I was disappointed that I did not receive a reply, despite waiting for three business days. Szervernet has a large following on Facebook, but it also has several negative reviews commenting on downtime, as well as inflexible contracts. Regardless, if you’re in the market for a budget host, Szervernet does offer most of the normal expert features, just with a presumed low level of beginner-friendly tools. 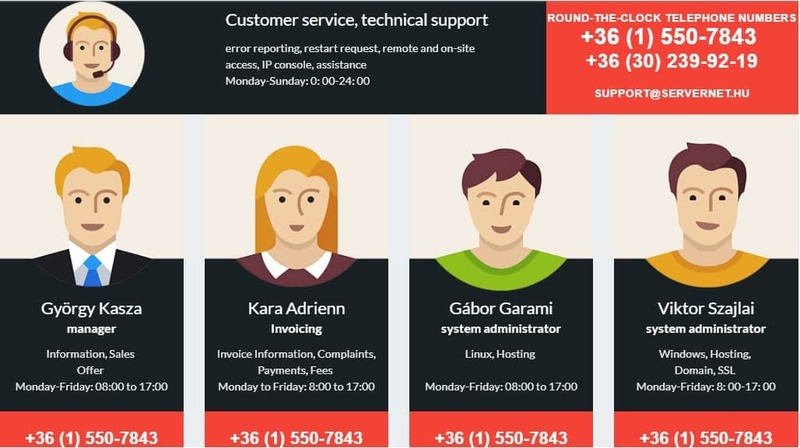 Wondering how Szervernet stacks up against other Web Hosting companies? Enter any other Web Hosting company and we will give you a side-by-side comparison.